I just wanted to share my manicure this week. 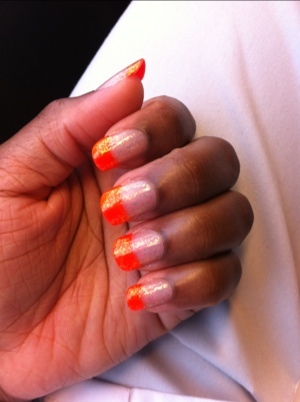 The tips are done using POP Nail Glam in Orange. I’m loving the neons! I used Essie “Shine of the Times” over it for the sparkle effect. It also helps my nail polish stay on longer (added bonus). I always love French Manicures in color! My manicure was pretty plain this week. I’ve got a solid dark color on that I wore for my daughter’s graduation. It’s like a chocolate.